With the development of the society, the impact of human activities, flood disasters is becoming more and more frequent accidents. It has heavily damaged people’s life and property. ability .So that we can protect people’s lives and property after getting the early warning information. Hydrology and watershed management, flood control and monitoring system by the center, sub-centers (county and city) stations, field units constitute a set of three hydrological telemetry network. The completion of the system will improve the hydrological information collection, transmission and processing methods, data collection and reduce the time required to forecast operations， improve the reliability of information collection and transmission, information processing capabilities to improve flood control basin. Watershed management center through the LAN or WAN computer network and sub-centers all over the data transmission between stations, and mainly to provide data for various applications, such as flood control and information collection and processing system , flood monitoring system, flood control consultation display system, information retrieval system, meteorological service system, flood control system, damage assessment system. Hydrological information collection station can be divided into water stations, rainfall stations, and installation by the composition of the corresponding sensors, and accurately capture relevant real-time water level and rainfall data. which with RS-232/485 interfaces, metal design, it has a small, low power consumption, configured using simple, plug and play . Support the standby data path, parallel data channels to support a variety of real-time online and on-demand online work, such as off the assembly line and equipment on a regular wake-up and support APN network access and other functions not only safe, reliable data protection also allows customers to savings rates to be transmitted. Monitoring center mainly by the central server and system software group,which is responsible for the acquisition of the hydrological stations upload up data analysis, storage, various control instructions issued by the monitoring stations and publish a variety of early warning information. 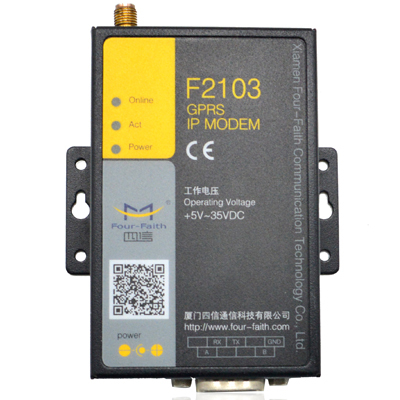 Data acquisition equipment acquisition station RS232/485 communication interface via a serial connection with the F2103, the monitoring center server can use an ordinary ADSL line or other APN as a network access. Communications equipment F2103 Internet access through the wireless network to connect to the monitoring center server host, create a transparent data channel.As long as the resulting data collection terminal to the serial port, F2103 will send the data to the server host center. 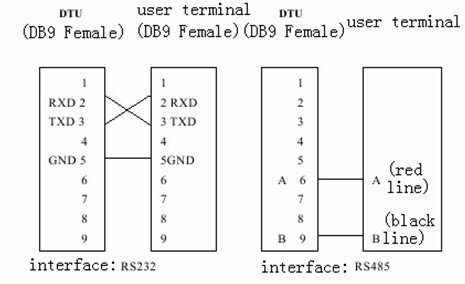 Uploaded onto the server host receives the terminal data of the primordial comprehensive analysis of the data and the various judgments issued to the terminal control command, control instructions issued by the host server through the channel after the transfer to the F2103, F2103 sent through the serial port to a collection terminal, in order to achieve transparent bi-directional transmission of data. 1) data reception, processing: real-time telemetry stations received rainfall, water and other information; automatically checks the data frame format, and make reasonable judgments; filling time scale, auto storage. 2) response, the query: Query time or under the site of artificial rainfall, water and work status. 3) Database management: Includes the original, historical, forecast, or the formation of the results database, search, query and so on. 4) Data output: can display (including large-screen display), printers, plotters and other output histogram of rainfall, water level, flow process lines, such as rainfall charts and so on. 5) Flood Forecasting and Scheduling: initialization parameters, including flood forecasting, the parameter set / change, time off-line assessment report forecast, reservoir optimal scheduling, results storage, output. 6) Network Communications: LAN or WAN can access data sharing, enabling multiple computers serial communication, via the telephone line data transmission can be realized. Such programs, whether real-time, security and stability of a solution than before has greatly improved the safety requirements for higher data points are more demanding real-time applications. The case of funds, the best networking. Center for the public network using ADSL connection, etc. INTELNET, the use of public network dynamic IP + DNS resolution service. Customer first with the opening of the dynamic DNS service provider to contact domain name, IP MODEM connected first address by domain name DNS server, and then find the center of the public network DNS server dynamic IP, the connection is established. In this way the public network can greatly reduce the cost of a fixed IP, but the stability of the DNS server, the stability of the subject, so to find a reliable DNS service providers. Such programs suitable for small-scale applications. Center for the public network using ADSL connection, etc. INTELNET, using a fixed IP public network services. Such programs first INT ERNET operators and other broadband ADSL application, the center has a fixed IP in public network. IP MODEM launched directly connected to the center. Reliable and stable, recommended such a program. The first thing is about the configuration software, the current configuration software manufacturers have integrated many of our drivers, and can be directly configured to use; followed by reading the serial port for the program was originally to provide a virtual serial port software (TCP2COM); Finally, for those who want to develop their own unique data center software to customers, we will provide a dynamic link library, and our company's data center software, open source not only for themselves but also assist clients throughout the data center software and functional development. Through dynamic link library customers may quickly develop a flexible, stable, fully functional interactive device management and data center software. 1, low power consumption, high accuracy, stability, reliability, strong anti-lightning and interference, each measuring unit can be connected to several different types of sensors. 2, System security, high reliability, timely and accurate analysis of the data. 3, Through the wireless network access, can be completed in a short period of time within the jurisdiction of the scanning station, monitoring the working status of hydrological telemetry system, and can judge the equipment is working properly, and to achieve status collection and remote output. Parameters of transmission module supports remote configuration changes, control, devices do not have to work for a few changes to the site, the operation of the system, save a lot of manpower and resources. 5, Terminal transmission module supports a variety of wake-up methods, such as voice, messaging, data, and reliable network connectivity, smart anti-dropped calls, supports online monitoring, online maintenance, dropping features such as automatic re-drawing to ensure that equipment is always online. The moment when the terminal equipment failure can send SMS alerts notify maintenance personnel. 6, Terminal transmission module supports a variety of wake-up methods, such as voice, messaging, data, and reliable network connectivity, smart anti-dropped calls, supports online monitoring, online maintenance, dropping features such as automatic re-drawing to ensure that equipment is always online. The moment when the terminal equipment failure can send SMS alerts notify maintenance personnel. 7, The transmission module is the primary backup center and the main center features automatic reply, while support for simultaneous multi-center function (up to 5); data centers to support multiple access methods, such as APN, fixed IP, dynamic IP, dynamic domain name and so on. 8, the equipment used industrial design, metal case, external power supply DC 12V/500mA; Communication current: <250mA(12V); Operating temperature -25 ~ +65 º C; Storage temperature -40 ~ +85 º C; 95% relative humidity (no condensation); multiple hardware and software watchdog. 9,We can provide secondary development kits and multi-language version of the data center server software to customer needs for secondary development; the same time for the customer's needs, providing a variety of technical support, including networking products, network design, technologypersonnel training, software development technology with full equipment on-site commissioning technical support services. The system established on the basis of the wireless communication network for data transmission, the central system in real time, accurate access to the terminal data, quickly to make judgments after data analysis.